Hi Karen! I'm not... I'm pre-amping a pre-amp. It works for me, and there's added tone control flexibility. Been using this for almost two years and I keep going back to it. Once I have all the gain stages set correctly in a sweet spot, it's very quiet and very responsive to touch. I've used the V8 in front of regular combo amps too like my LTD or a Nashville 112, it's not how you're supposed to do it, but it's been working for me. My V8 had a output level control on the back panel. And my Tone Block had a gain control that went from "Line" to "Guitar". It did not actually bypass the Quilter preamp, but it was workable. If you want to bypass the quilter preamp you just plug in to the effects return jack. This will disable all controls except the master volume. Check out the correspondence I posted from Pat Quilter earlier in the thread for more details on this. My Tone Block 200 was an early model with no effects loop. Good thing the newer ones have it. Hi Brett, I use two of Jay Ganz's Straight Ahead Power Amps. They are small, less than 1 lb, with a lot of clean power. I use these with 2 Tommy Huff Cabs. Great combination. I've used my V8 going into the Quilter input and also using the FX return. Both sound good to me, but I haven't used that set up for a gig. For me, the V8 is most useful with my Stereo Steel, which I had built with a second aux in where the tuner out usually is. That aux is post EQ but pre FX, so I plug the V8 in to it, add an AB switch, and I can switch between alternative steel sounds with the same FX settings. 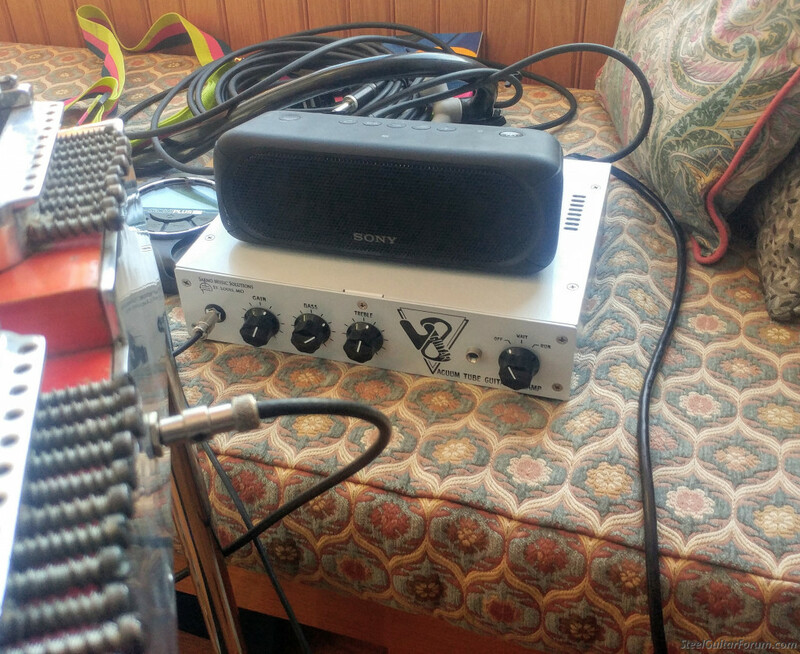 I can also use that V8+aux channel for guitar and avoid carrying a second amp. Works great. Anyone have a contact address for Jay Ganz's ? If you're handy, you can buy class D amp modules at a very low cost. I tried one I bought at Amazon for 10 bucks--40 Watts I think. Works great in a homemade powered speaker with the V8. Runs off of a laptop power supply. I did another that was from Dayton Electronics that I paid about 25 bucks for plus another 25 or so for an appropriate power supply. 100 Watts. In a powered speaker, it too sounds great with the V8. I have a Quilter Toneblock in the rack where my V8 lives, but the other two Class D amps sound virtually identical to the Quilter if you leave the Quilter's tone control alone. But, the Quilter's midrange control really is a nice addition to the V8 in my rig. I don't bypass the Quilter's preamp. I have the output level control on the V8 turned down, and dial the Quilter towards "line." It would be very easy to live with either of the cheap Class D powered speakers I have built. You can buy them at pretty much any wattage you want--you just need to match up a proper power supply. I agree. Been playing around with this little rig at home. It sounds quite good. Sarno V8 is an excellent preamp. 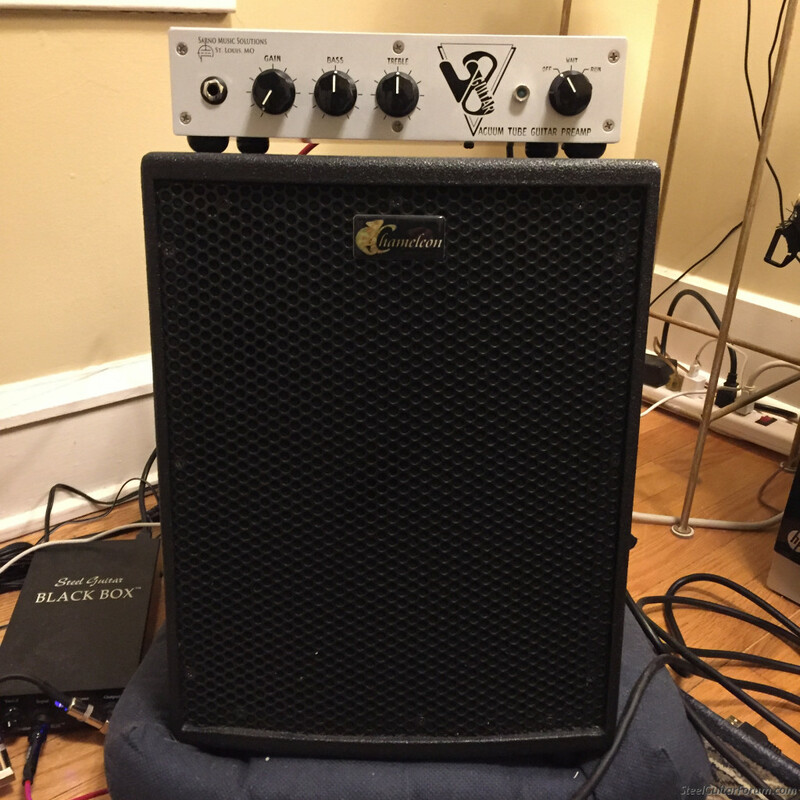 I’ve played it through a Straight Ahead (very nice), a Quilter 101 into efx return (also very nice), a Carvin tube power amp 100 watts (truly fantastic, but amp died...). I now play the Sarno through a powered Buscarino Chameleon 1x8 cabinet which is the best, most transparent I’ve found. I do play mainly jazz archtop these days. I also think that use of Sarno black box tube buffer makes any Class D amp sound warmer as well. Love it. I was able to trade my Twin custom 15 for a Steelaire. Probably won't need a powered speaker anymore because this thing will work great for a lightweight, small amp that I don't have to worry about.. It was cool to try the amp on it's own and with the V8. The best sound to me was going into the V8 and right into the front of the Quilter - having the master volume control on the back of the V8 really helps for this setup. I preferred the sound of the Quilter on it's own vs the V8 into the effects return of the Steelaire. The three knob reverb on the Quilter is really nice too. Hats off to Quilter and Brad Sarno for making such great steel guitar equipment. to my ear, there's something about the V8 into the front of the Quilter preamp that clicks! Having the gain stages worked out is key.